This whole week we are celebrating Pentecost. That is the culmination of Easter. Jesus conquered death. He is alive with God. Suffering, disease, hatred and violence are not the last word. What are we celebrating in this feast of Pentecost? Before his death, Jesus made a mysterious announcement; he said to his disciples, I will send you an Other who will help you, he will be with you always; he will even be within you. This announcement is for us, too. This Other who is with us is the Holy Spirit. Christ also called him “power from above.” Do we realize enough how extraordinary this message is? After the resurrection of Jesus, God comes to dwell within every human being. God’s presence is infinitely discreet. If we cannot always feel this presence, this is not because our faith is insufficient, but because God does not impose himself. God never does violence to our consciousness; he respects our dignity and autonomy. Faith is that simple trust in his presence within us. Believing that the breath of the Holy Spirit speaks in our depths God’s yes to our existence. And his presence in us awaits our yes in order to come to fulfillment. The account of the first Pentecost tells us that the time has come when God pours out His Spirit—according to the age-old promise of the prophets—upon all human beings. 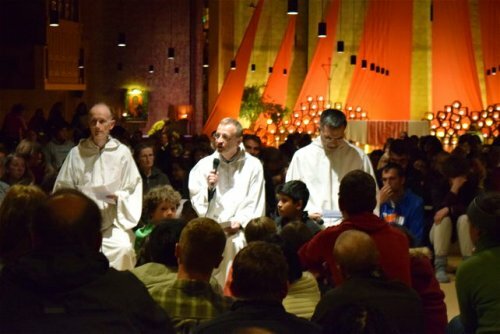 This universality of God’s love for all people and for all creation is the reality that perhaps interests us most passionately in Taizé. This is one of the reasons for our life in community. Coming from thirty different countries, from different Churches, we want to be a little parable of this universality of God’s love. So whatever separates and opposes human beings hurts us. What can we do when faced with the oppositions in the world? There are so many unjust structures that must change. We would like to support those who are committed to this work. At the same time we do not only want to denounce evil but to commit ourselves personally. An answer that we can all put into practice is not to be afraid to touch other people’s wounds. On the contrary, we should go to encounter them. In many European countries, among those wounded, there are especially migrants. Last year we welcomed to Taizé a family of refugees from Iraq, then young Sudanese men and one Afghan. I also think particularly of the people of Syria. I spent Christmas in that country and often faces or particular words spoken to me come to my mind. The fighting in Aleppo has begun again. Let us pray for those people who have undergone such trials. The world is increasingly torn apart. But we can plant seeds of unity. That was the goal of our pilgrimage in Romania. All of us can, wherever we are, plant seeds of unity. The Holy Spirit is with us, and supports us. Metropolitan Serafim of Romania who was here last night and this morning had to leave already. It was a beautiful visit. And now Poojith, from India, will name the countries of all those who are present and to whom the children will give flowers.